My husband was very pleased when he gave me Katie Ward’s Girl Reading for Mother’s Day. “It’s meta,” he said. “You see? Get it?” I did, and I was so much intrigued that instead of letting it languish on my TBR shelf for a few years as I often do, I read it straight away. Girl Reading calls itself a novel. I’m not so sure: it is seven short stories, linked thematically but otherwise only by the most tenuous of connections. Each story grows out of a visual image of a girl or woman reading. Usually, the story is a vivid imagination of how that image came to be. The stories revolve around the inner lives of the women, not around the reading per se; often the book is incidental to the personalities involved. The writing is lively, and the project is ambitious: what draws us, over and over, to this image of the reading woman, with her inner, hidden life? 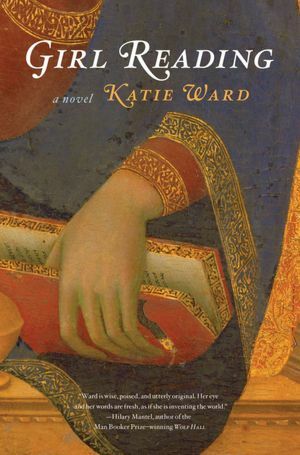 Ward skims over place and time, moving from the life of a deaf Flemish maid to an independent woman reading alone in a bar in 2008, and even beyond, into a future when books have become scarce. Her images are all Western, which is a bit of a limitation of imagination, and one or two of the stories are slightly less effective than others (such as the story in which the main character’s dead lover appears to her at the end.) But for the most part, this was a wonderfully enjoyable debut novel. I am a fan of the short story, and don’t usually suffer from wanting it to expand, but I was ready for a couple of the stories to go on: “Immaterialism,” set in the modern day, in particular, left me wanting more details, more of the characters, more of the writing, just… more. That’s not a criticism. That’s a delight. So — here I am, a girl reading Girl Reading. Very meta. Have you read it? What did you think? I have this to read, so am very encouraged that you enjoyed it. It’s the kind of ambitious concept it would be easy to do badly! I agree that including the images would have been an excellent idea, but I didn’t know they were available online. I will go and look. Many of the images are available, but some of them aren’t (and a couple of them couldn’t be, by definition) so that was frustrating. I do wish they had been included, even at an increased cost of the book. And yes, I did enjoy it. I think it had a few rough spots, but it’s both well done and promising. Yes, I would have liked to see the images as well. I collect pictures of women reading. Nevertheless, I’m going to have to get a copy of this and I know of at least two other people for whom I want to buy it. Thank you. I can’t say I collect those images, but I have a couple of books of them, and I do love them. It made the concept of the book very intriguing for me. I read it but did not love it. It really felt like a short story anthology and not a novel.I think I just wanted it to be something different than it was. Images would have helped it a great deal. I think it was more than an anthology because the stories were certainly linked thematically, as well as by internal references to each other (and the last story kind of bound them all up with each other.) But I know what you mean; the links were weaker than a real novel would have made them. It sounds intriguing, but I’m already disappointed that the images aren’t included in the book. Yes, I really would have liked that! But I browsed for them online, and that helped. I haven’t read it yet, but it’s on my list! Thanks for the review. I have often found that anthology-like books vary so widely that it seems almost inevitable that people love a few entries and aren’t wild about the others. Is this a good thing – does it make it possible for these books to appeal to more people? In any case I look forward to this book, but it might be a while for me, since I don’t think my public library has a copy yet! That’s a good question, Samantha, though I have mostly found that the same stories appeal to most readers in this collection. I think some are simply stronger than others. And I’ve found that in the book-blogosphere, some people just don’t like short stories at all! (I do.) But I do recommend this one. Seems to me like the images, which appear to be Ward’s inspiration are vital to the collection, so it definitely seems strange that they were left out! Normally, I don’t care for short stories (they so often feel incomplete to me, and I tend to find them frustrating), but I remember hearing about this collection and thought it sounded intriguing (plus, the fact that the stories were purportedly linked, appealed to me as well). Not sure if it would ultimately be my cup of tea, given your take, but I do like the sentiment behind the collection. I wonder if the decision about leaving out the images was a question of price point…? Especially since it’s a debut novel. I’ll warn you that the stories are linked thematically (girl reading, duh) but not really otherwise. There are a couple of brief internal references, but they are not the point of the stories. I liked the collection, but I do like short stories! I’ve got this in my TBR and I’m pretty excited. I presume copyright and permissions plays into why this book doesn’t include the reference images, but that’s still a little disappointing. When there’s a clear visual inspiration, one wants to see it! Right, copyright and permissions — who would control that with something like the Annunciation triptych? The museum? Anyway, it would have raised the price of the book. But it would have been nice to have it. I think that not including the images that are supposedly both the inspiration and the thematic linkage of a book is more than a “nitpik”–it’s a significant oversight. It’s one thing to write a piece of fiction that refers to a work of art, but once the writer has made it clear that she used specific works of art as jumping-off points for her work, I think she and her publishers owe it to the readers to do what they can to reproduce the images–or at least to provide an afterword with links to the where the works can be seen on-line (where possible). I hate to sound like a grumpy gus, but I believe that not being able to see the images would bother me to the point that I might not be able to enjoy the associated fiction. She does include a list of the images at the end, with the information about the artists, so if you’re net-savvy, you can look most of them up yourself. (A few are not available online.) But there aren’t links, and I agree that the book seemed strangely impoverished without it, given the concept. I’ve had it on my TBR for at least one year. 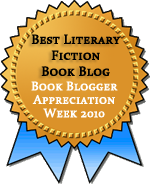 I know that some book bloggers are starting a read-long at the end of June, so I might join. I’ve recently posted about my favorite paintings of women reading, so it’s right up my alley. I’m not a huge fan of short stories, but I’m a sucker for stories about reading. Too bad the pictures weren’t included, though. Do you know other stories about reading? Do make recommendations if you do!